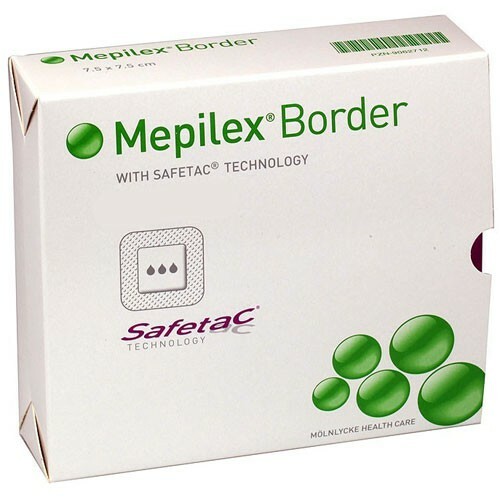 Mepilex Border, by Molnlycke Healthcare, is a multi-layered foam dressing the is designed to absorb wound discharge and protect the wound from infiltration of microorganisms. 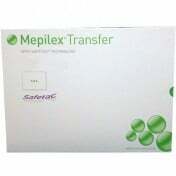 This dressing is an all-in-one bandage that will not need a secondary dressing to affix it to the skin, has its own absorbent properties, and will protect the wound from external microbes to make for an ideal healing environment. 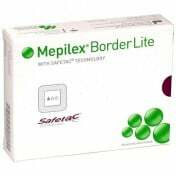 Mepilex Border is a type of foam dressing designed to create an optimal healing environment for moderate to heavy exuding wounds including pressure ulcers, leg and foot ulcers, traumatic wounds, and other open wounds. 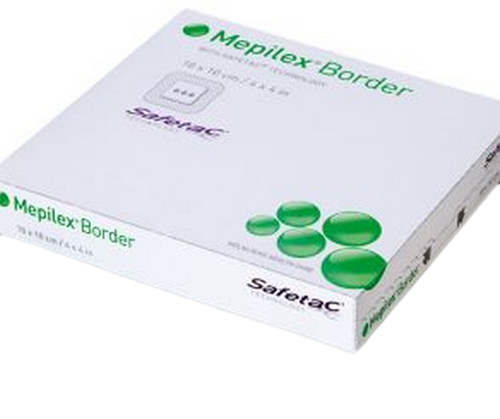 Mepilex Border includes a porous gel that is the first material to contact with the wound. 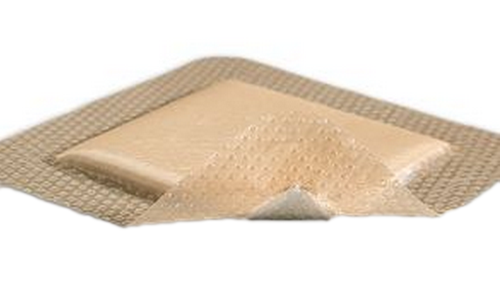 This gel is stuck to the above absorbent material and will create a moist environment within the wound bed. 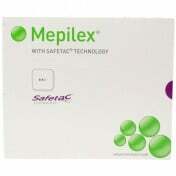 The absorbent pad above wicks away the wound discharge intersperses the moisture throughout the foam. The backing material will protect the wound from external infectious material, yet allows the wound ample air circulation. With supplemental moisture along with and a means of air circulation, an ideal 'climate' is created to promote healing. 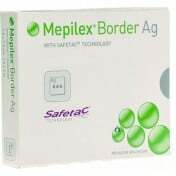 Mepilex border adhesive utilizes the patented Safetac technology. This adhesive sticks well to the skin, yet will remove easy with little pain. 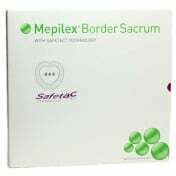 The border minimizes the risk of infection and maceration by sealing the edges and keeping the exudate from escaping the dressing. 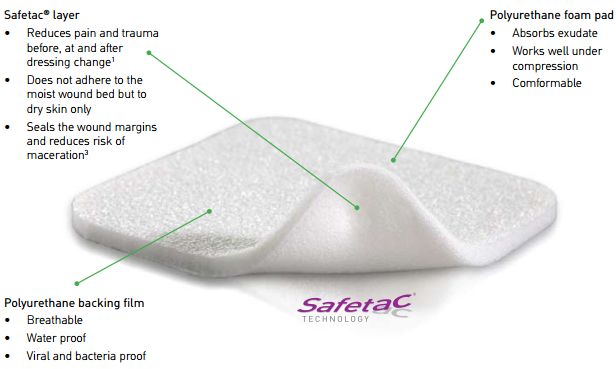 The Safetac layer ensures that the dressing can be changed without damaging the wound or surrounding skin. The all-in-one dressing treats chronic wounds like pressure ulcers. The mix of foam, gel, and porous cover makes for an ideal healing climate. 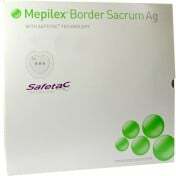 It is great for wounds with moderate to heavy exudate. 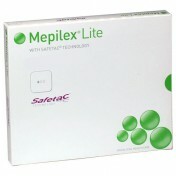 The Safetac technology will allow a safe removal of the adhesive with low incidence of damaging the skin. Each line item should have its box contents available in the description. Each description has its box contents available (5, 10, etc). 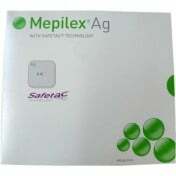 We have been using the Mepilex for years. These are great. I AM HIGHLY ALLERGIC TO TAPE, ALL TYPES. HAVING A CUT, WOUND IS DIFFICULT TO DRESS AND CARE FOR. HAVING THE MEPILEX BANDAGES RELIEVES A LOT OF ANXIETY PARTICURLY FOR MY RECENT CUT. THEY DO NOT WRIP MY SKIN AS ALL OTHERS DO. HAVE TRIED EVERYTHING AND THIS IS THE ONLY PRODUCT THAT I WILL USE. These are so absorbent and are super easy to change. You can really see the drainage pulled away from the wound and soaked in the pad. It's like a diaper for your wounds. this is an amazing product. it works just as it says that it will. it stays put and is easy to remove when you are ready with NO PAIN. this is truly a lifesaver for people who have to have long term wound care. NOT DREADING your dressing changes really help with the emotional toll of being ill. I had a very severe arm laceration, with much of skin and flesh off after a fall on a rock. After cleaning and stictching what they could they applied mepilex border . i was afraid it would pull my skin off and he hurt the wound when taking off. I changed it every three days for 3 weeks. It never hurt upon removal and the wound healed amazingly well. Just leaving a scar. Made a mistake on size of order. Called 1 hour after ordering. Was informed I was too late!!!. Will NEVER order again from them. The skin on my leg is breaking down. I had several sores that were leaking. I am happy with the performance of this product. My wife had a wound on her thigh that required to have a bandage on it all the time. They are easy for her to use and change by herself. Best bandage ever. These bandages are the best for wounds - there is nothing else to even come close to this product. An excellent product. They are worth every penny you spend on them.